• The famous cosmonaut, Alexei Leonov, the first person to make a space walk and member of the Starmus Advisory Board since it first began, designed the medal with a portrait on the front of the well-known British theoretical physicist. • The music and space that are brought together at the most ambitious science festival of all time are represented on the back of the medal, with an image of the first space walk and the "Red Special", the emblematic guitar of another of Starmus's main participants, the guitarist Brian May. 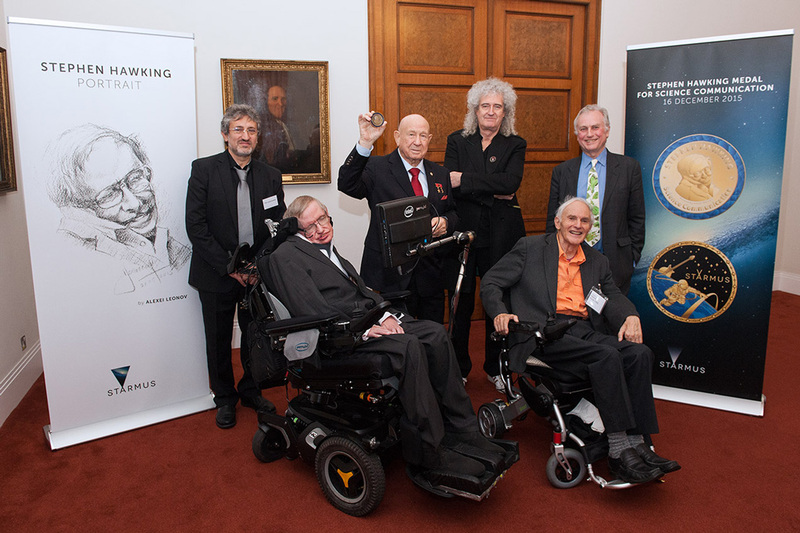 LONDON, December 16, 2015 — A ground-breaking new award for science communication in honor of Professor Stephen Hawking was announced today at the Royal Society in London by a panel, including Hawking, Dr. Brian May, Prof. Richard Dawkins, Alexei Leonov, and Prof. Harold Kroto. The first of its kind, the medal will recognize the work of those helping to promote the public awareness of science through different disciplines such as music, arts, and cinema. Each year, three medals will be awarded at the STARMUS International Science and Arts Festival in Tenerife. “By engaging with everyone from school children to politicians to pensioners, science communicators put science right at the heart of daily life. Bringing science to the people brings people into science. This matters to me, to you, to the world as a whole. In addition to this, Professor Israelian revealed the citizen participation through a popular voting process on social media to decide the award on The Starmus Science Communicator of the Year – Filmmaker category, inviting the general public to participate on the awards and make history. The design of the medal used a portrait of Professor Hawking by cosmonaut Alexei Leonov, the first man to perform a spacewalk and member of the Advisory Council Starmus since its first edition. The other side combines the image of Brian May, that of the first spacewalk, and the iconic guitar – the "Red Special" – to demonstrate music, another major component of the Starmus Festival. As well as the speakers’ panel unveiling the medal, many special guests participated in the press conference, including Phantom of the Opera singer Sarah Brightman, having recently joined the Starmus music panel, and renowned composer Hans Zimmer. Dara O'Briain, Prof. Brian Cox OBE and Prof. Kip Thorne were also in attendance, alongside representatives of the Canary Islands, privileged setting of the festival, including Managing Director of The Canary Islands Tourism Board, Ms. María Méndez, and the Councillor for Tourism in Tenerife, Mr. Alberto Bernabé, attended the presentation. Starmus Festival was born with the aim of making the most universal science and art accessible to the public. The music and space festival brings together the brightest minds from astronomy, prominent space travellers, astrophysicists and stargazers with tech business chiefs, and leaders of our creative industries to debate the future of humanity. After two ground-breaking editions in 2011 and 2014, gathering together the most important representatives of these fields (Neil Armstrong and Professor Hawking), the program for Starmus III will feature an unforgettable series of lectures to enable the general public to get a better picture of science, in line with the spirit of education that the festival has espoused since its inception. In addition to its lectures delivered by some of the world's most prestigious speakers, the festival will again have a music program with unique events such as the Sonic Universe concert, including a performances by Brian May and singer Sarah Brightman. Another of the highlights will be the “Ask Hawking” competition which as in the previous edition will enable members of the public to pose questions to the great scientist. This unique opportunity is an additional asset in this incomparable event. The organization will announce details of participants and performers in the months before the festival. Apart from the lecture series and musical events, Starmus III will make further progress in bringing science to the general public through activities for new audiences, including children, that will make it a “cosmic experience” for all concerned. Another milestone of this edition is that it will bring together no less than twelve Nobel prize winners in such disciplines as physics, chemistry, medicine, astronomy and even a winner of the Nobel Peace Prize. The innovative panel of speakers exemplifies more than ever before the event's aim of bridging the gap between the general public and the exciting world of science through these inspiring figures.